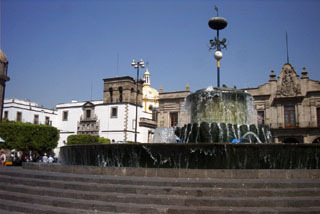 Main square in Guadalajara near large Cathedral which Pope visited when he came to Mexico the first time. 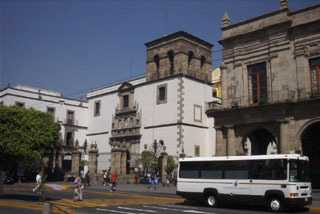 The government buildings were styled as if they had been built in the 16th century, but they were constructed in 1952! 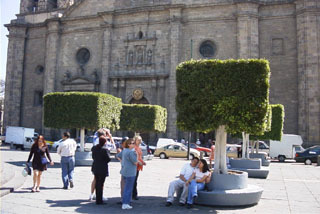 Surrounding the Cathedral are 4 squares set in the cardinal directions. This one is in front. There is a fountain to the left. 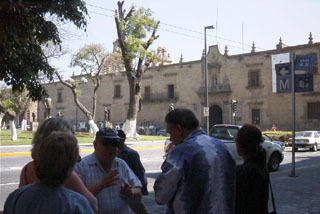 Facing the cathedral are office buildings with lawyers', doctors', dentists', notary publics' offices. 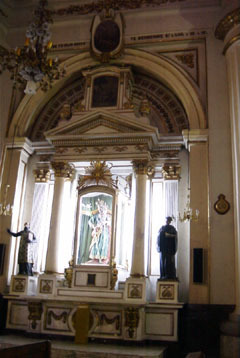 Side entrance to Cathedral. Shows what used to be a Jesuit building, later converted to a school & now an art museum. Built ca. 1600 AD. Side of Cathedral looking up at one of the towers rebuilt after earthquake in the late 1800s. 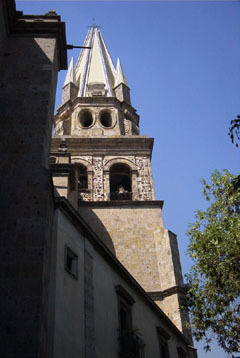 Cathedral is a mix of native stone & brick with mosaic tiles in the steeple. There are 4 bells in the two towers of different sizes. 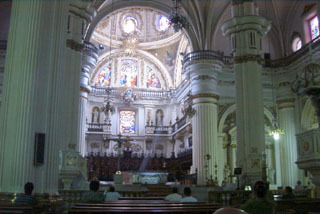 Inside the Cathedral. 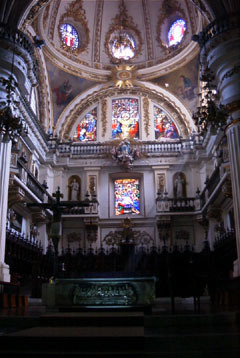 The Cathedral was completed in stages. 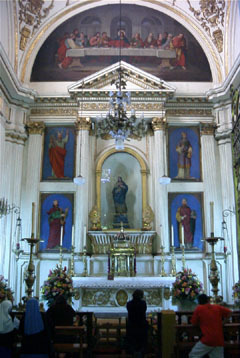 Most of the side altars & niches were done in the 19th century. 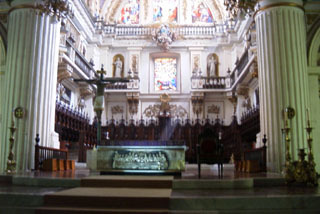 The altar is silver, locally produced, & installed post-Vatican II. For some reason, our guide touted the German windows rather than the ones done in Mexico.